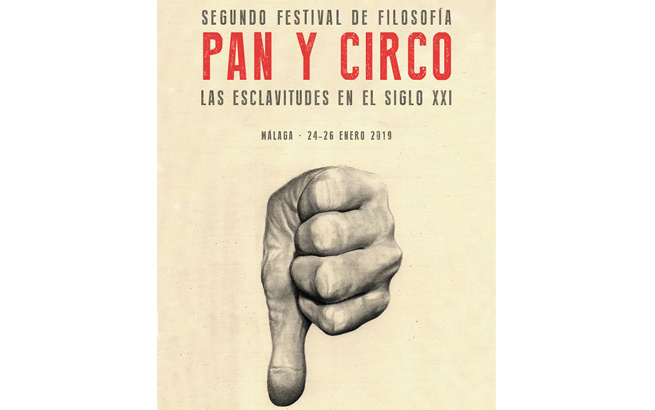 The Second Philosophy Festival, organized by La Térmica, will be held at different venues around Málaga during the month of January 2019. Over twenty thinkers, philosophers, writers and cultural critics are among the guest speakers who will be discussing new forms of slavery. With the title Bread and Circuses: 21st-century Slaveries, this second edition of the festival looks at the exploitation of needs, the digital world, human trafficking, and the humanization of robots vs. the robotization of humans. Luca M. Scarantino, Professor of Theoretical Philosophy and President of the International Federation of Philosophical Societies (FISP). - Manuel Cruz Rodríguez, Professor of Contemporary Philosophy at the Universidad de Barcelona. - María José Guerra, lecturer in Moral Philosophy of the Faculty of Humanities at the Universidad de La Laguna, and Chair of the Red Española de Filosofía. - María José Frápolli Sanz, Professor at the Department of Philosophy I, UNiversidad de Granada.